Another great way to get people to visit your website is to reach out with an old-school medium: print advertising. With newspapers struggling for ad revenue, now’s one of the best times to place ads. Prices are low, and you have a better chance of getting in front of your audience. Here in Colorado, the Rocky Mountain News (the #2 daily newspaper) is closing shop. The Chicago Tribune is laying off staff and is in Chapter 11 Bankruptcy. So Why Advertise in Newspapers? People still read the newspaper (not as many as 20 years ago, but circulation numbers are still high). Less advertisers spending less money means your small ad gets more prominent placement and more attention. Newspapers are willing to wheel and deal to get additional revenue. People Pay Attention To Companies That Advertise in Tight Times. Studies have shown that companies that continue to advertise and market aggressively in tough economic times gain marketshare, and those that don’t tend to whither away. Now I’m not saying companies shouldn’t cut back on some marketing expenditures, or shift dollars around. It’s important to allocate your marketing budget wisely. But companies that advertise in tight times create the impression to the end customer that you’re here to stay, and you’re continuing to be successful enough to spend a little bit of money advertising. Nothing Succeeds Like Success. Sir Arthur Helps coined the phrase (at least into print) in 1868, “Nothing succeeds like success.” We as humans like to align ourselves with winners. We like to be with people that can take our challenges, hopes and aspirations and turn them into reality. Continuing to advertise creates an impression that you’re successful, and makes people feel comfortable spending money with you. Know your audience. What newspapers do your potential customers read? Why do people decide to go with your organization vs. another one? Design an ad with a strong call to action. 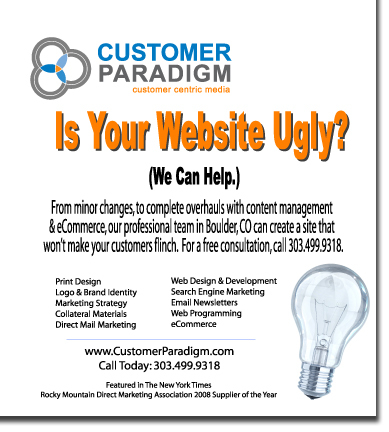 The call to action is often to visit your website for more information. But tell people what you want them to do. Ask A Question. Often asking a question can engage a person in a way that a statement can’t. Ask your local newspaper if you can run your ad on a space available basis in exchange for a reduced rate. Most newspapers today don’t have a space issue, and you can often save significantly. Summary: Done correctly, Print Advertising can create an impression that you’re a successful company interested in soliciting more business. It can drive traffic to your website easily. And now’s a great time because ad rates are very low.